↑ "Morsi told he is no longer the president". Washington Post. Archived from the original on 3 July 2013. Retrieved 3 July 2013. ↑ Weaver, Matthew; McCarthy, Tom (3 July 2013). "Egyptian army suspends constitution and removes President Morsi – as it happened". The Guardian. Retrieved 10 July 2013. ↑ The spellings of his first and last names vary. 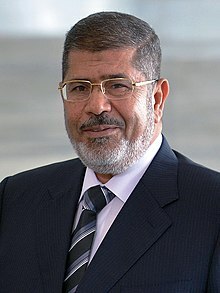 A survey of 14 news organizations plus Wikipedia in July 2013 found that 11 used "Mohamed" and four used "Mohammed"; nine used "Morsi", five used "Mursi", and one used "Morsy". The official Egypt State Information Service uses both "Morsi" and "Morsy".